Our work in the III-Nitride material system is focused on exploiting its unique physical properties to produce novel light sources based on intersubband transitions. 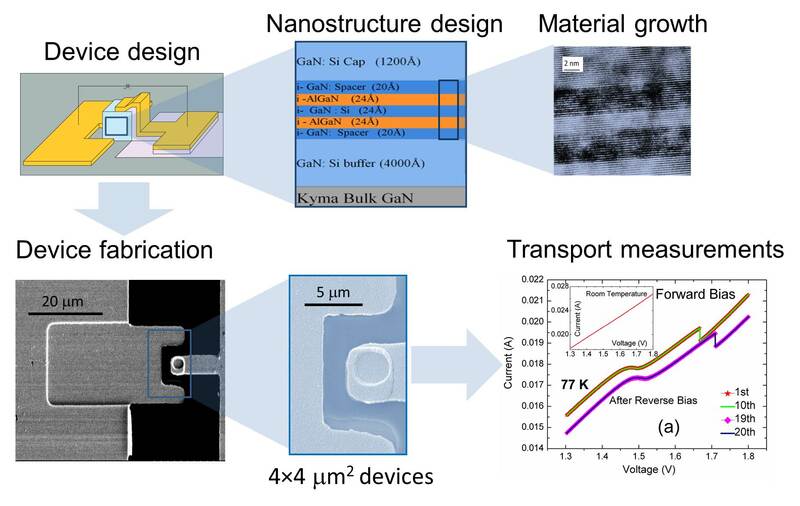 Due to the large conduction band offsets available in Al(In)GaN/GaN heterostructures, intersubband transitions can span the technologically important near-IR (~1.5microns) to far-IR (~100microns) spectral range. Demonstration of a quantum cascade laser in this wavelength regime is a primary goal. Material quality still limits device performance. The large lattice mismatch between GaN, AlN, and InN requires careful strain management and mitigation of deleterious effects induced by structural defects. In addition the low crystal symmetry of the wurtzite phase supports large spontaneous and piezoelectric polarization fields which can create unwanted electric fields in optical structures. To combat these issues our group explores novel growth schemes including the use of lattice-matched AlInN/GaN heterostructures to reduce strain and growth on non-polar m-plane substrates in which polarization fields are eliminated. Our group studies on the structural, morphological and electrical properties of the material we grow by molecular beam epitaxy. We collaborate with the Malis group to study intersubband optical properties.